I keep fogetting to post this show and there are only a couple of more days before it finishes. Pieces in the show deal with the subject of portraiture in a dark and slightly twisted way: human forms are placed in artificial, unnatural environments that are influenced by the many guises of branding and popular culture. The paintings combine skilled brushwork with references to old masters and Japanese graphic design. Micallef’s work examines modern society’s dichotomous relationship with consumerism, examining how people maintain to despise multi-national brands, yet still allow themselves to be seduced by them. His works make extensive use of corporate logos and icons from popular culture, which lend a very special style to his paintings. Went to see this one on Saturday and the Phil Frost's too. 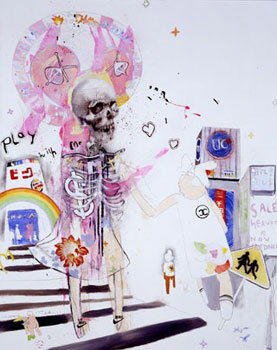 antony Micallef work is awesome!